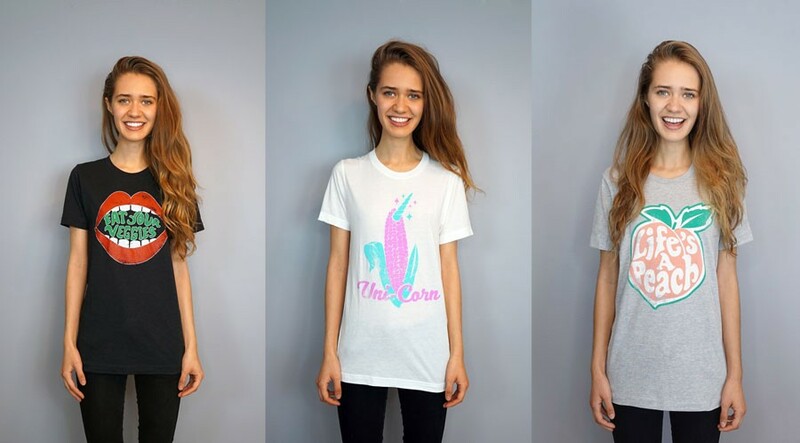 Vegetaryn is a vegan clothes brand that was founded in 2015 by Taryn (hence the name). Like most people who start ethical clothing brands, they always have a keen interest in animal welfare and organic eating. Taryn is no different and has an interesting background story on hope she became vegan and what made her switch to a plant-based diet. Based in Los Angeles, Taryn attended Arizona State University back before she was a vegetarian. During her time at University, Taryn would eat Taco Bell, Chipotle and McDonald’s almost every day. Around this time, Taryn stopped exercising, started drinking and continued her unhealthy eating habits. It wasn’t until Taryn started to study abroad in Barcelona, that she began to think about what she was putting into her body. While studying and living in Spain, Taryn noticed the Spanish tradition that involved hanging ham and other meats from the ceiling. Not only did this really gross her out, but it also made her to start questioning what she was eating. Once she returned from Barcelona and headed back home to the United States, Taryn returned to her “normal” eating habits. It was around this time that she started to feel extremely sick while getting horrible stomach aches. To stop this from happening, Taryn became a lot more conscious about what she was eating and ultimately changed her diet. She began to eat only whole, plant-based foods and the outcome was incredible! Not only did her stomach aches go away, but she also cured her asthma and her eczema. Not to mention she also lost around 20 lbs without even trying. After seeing the benefits of a vegetarian diet first-hand, Taryn just had to share her experience with the rest of the world. It was then that she created her own vegan clothing brand with the sole mission of sharing and spreading the core vegan values. Today, Vegetaryn sell a whole range of different items from sweatshirts and T-shirts to bags and custom collections made by big Instagram influencers. In addition to selling clothes, she also has a range of useful vegan recipes and educational information on her website. To Taryn, her brand is much more than just a business; it’s a place for everyone to learn about the benefits of plant-based diets. Recently, Vegetaryn has also released their own vegan sports brand called train vegan. Aimed at sporty individuals and gym goers, the brand is trying to break the stigma that going to the gym means you need to eat meat. In reality, there are plenty of plant-based diets that can help get you super learn or jacked up. Remember, there are plenty of plants with protein too! Vegetaryn isn’t the only cruelty-free vegan clothing line out there. In fact, there are loads of awesome vegan brands that need your support on the fight again animal rights! Check out our full list of vegan graphic tees and brands to discover loads of awesome shirts. By the time you’ve finished reading it you’ll never shop at Nike or Adidas again!